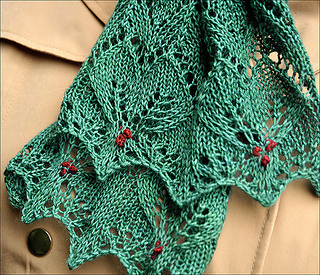 Holly & Ivy by Abbie Tilden is the perfect small project for carrying around in the summer heat. This project is a nice knit for winter while frolicking in the summer and trying to forget the inevitable onset of fall and then winter. The scarf is constructed in two pieces and joined together using a Three Needle Bind Off, much like Autumn joins Summer and Winter. The Holly berries are added later, perhaps during the season of eggnog and peppermint mochas while hurriedly knitting all those last minute gifts. 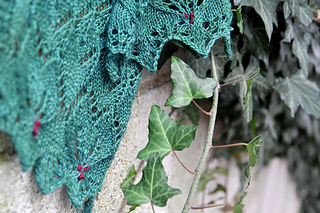 On Holiday has eleven lovely designs that uses 1000 yards of yarn or less! 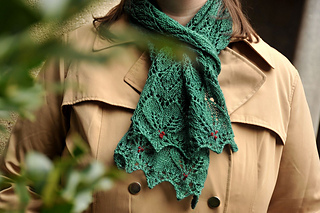 Michelle is known for creating beautiful patterns that use only one skein of luxury yarn and continues with that theme in On Holiday and combines her talents with five other talented designers to bring you the types of projects you’ll want to knit on your summer holiday or for the holidays! These patterns were hand picked from the best of the Holiday Yarn Club over the years and combined into one book in time for your own holiday knitting. There is something for every knitter in this collection. The book contains directions for mittens, socks, shawls, wraps, and a cowl. All patterns have thoroughly tested written instructions and charts where applicable.